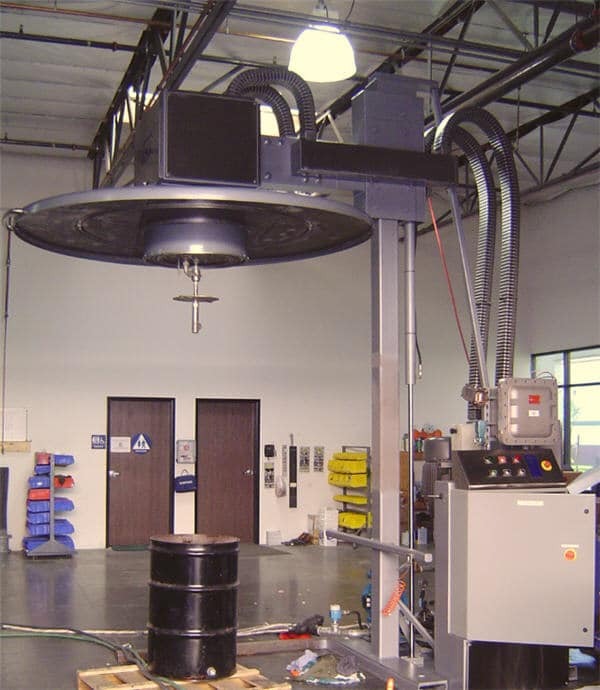 A Real SRS Customer Story – An automotive supply company came to SRS looking for a washer to wash multiple sized movable tanks and totes ranging in open and man way topped diameters from 18” to 60”. The tanks and totes were contaminated with proprietary resins and adhesives used in the automobile industry. In their current process, the tanks/totes were being washed with styrene. 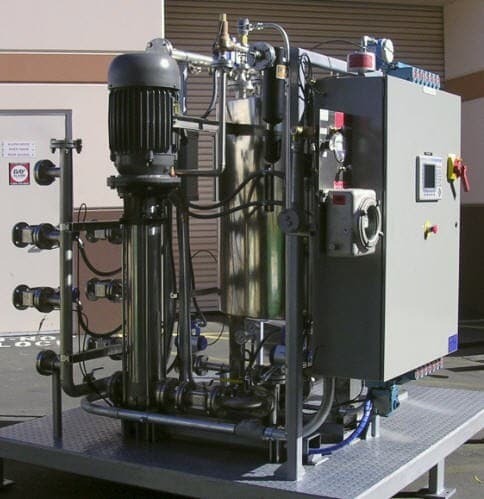 SRS designed and built a stainless steel/carbon, electrical rated (explosion proof) 460/60Hz tank and tote washer called the TW-500. This washer was designed for an interior wash and rinse. The TW-500 could house a very large open topped tank utilizing a reinforced skid to accommodate additional weights. 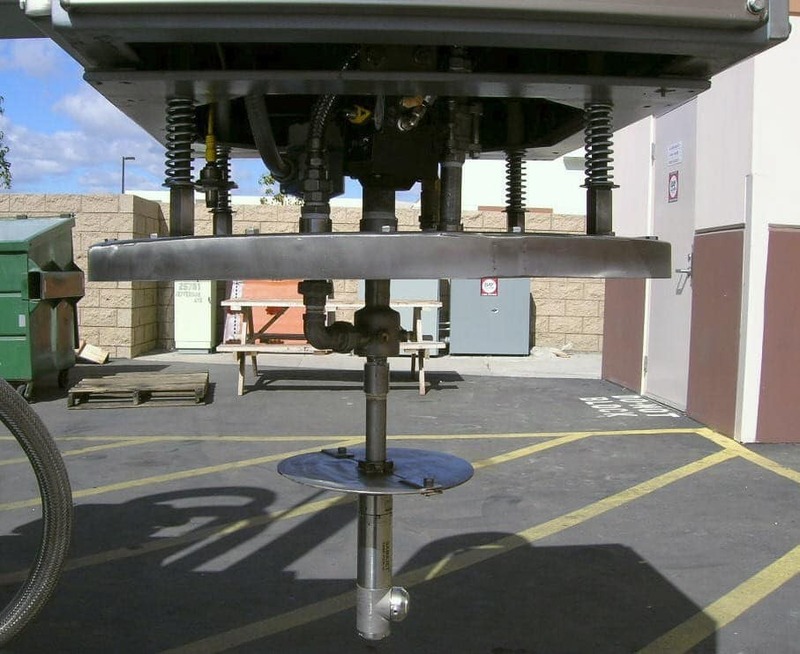 The specially designed custom sized washer heads could be lowered and raised hydraulically to provide added user friendliness for the operators. 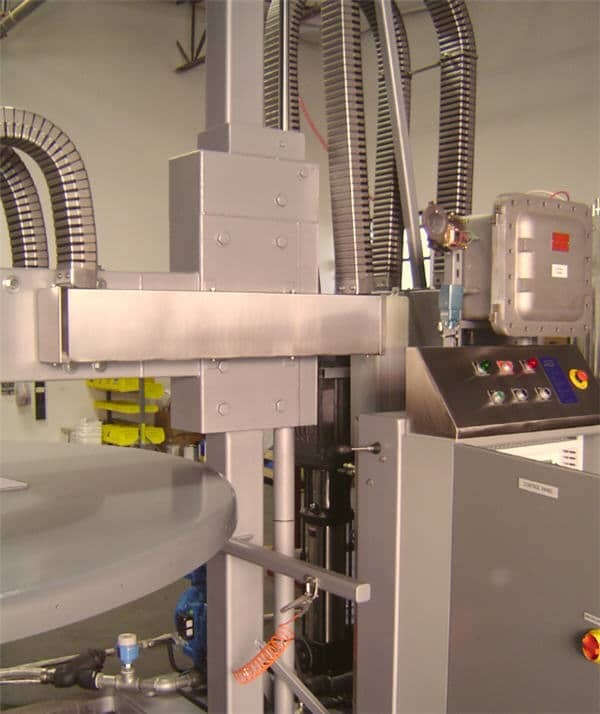 By incorporating the TW-500 system, the automotive company was able to improve productivity by automating the washing process rather than washing the totes and tanks by hand. 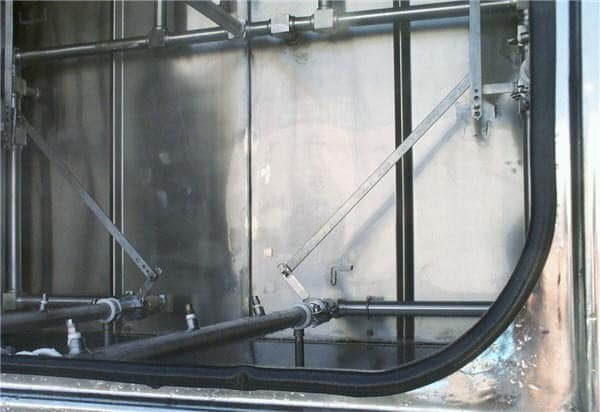 The customer was now able to wash 5-10 times more tanks and totes than before and eliminated the need to add additional staff to accommodate their growth. Furthermore, they noticed a 100% return on their investment in less than 6 months. 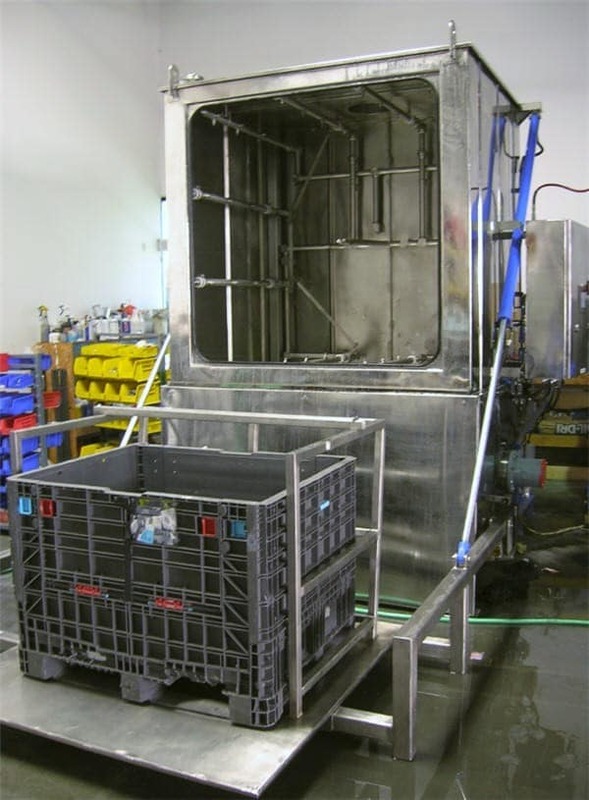 A Real Customer Story – A large food distributor came to SRS needing a washing system to wash and rinse the interior and exterior of their collapsible 48” x 48” x 48” plastic tote bins. The bins needed to be washed with very hot wash water to remove any dirt or food particles left on the totes. 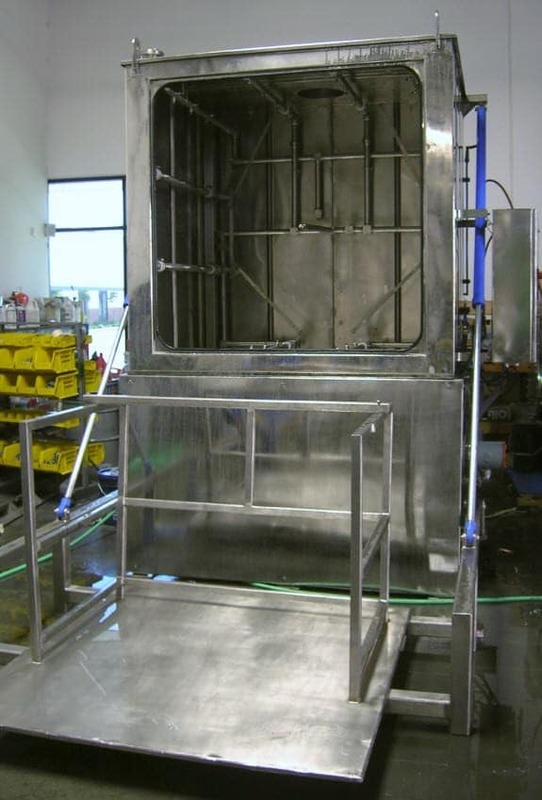 SRS designed and built a special washer (The TW-100-C) to hydraulically lift and load one tote per wash cycle. This washing process would take approximately 2-3 minutes from start to finish. 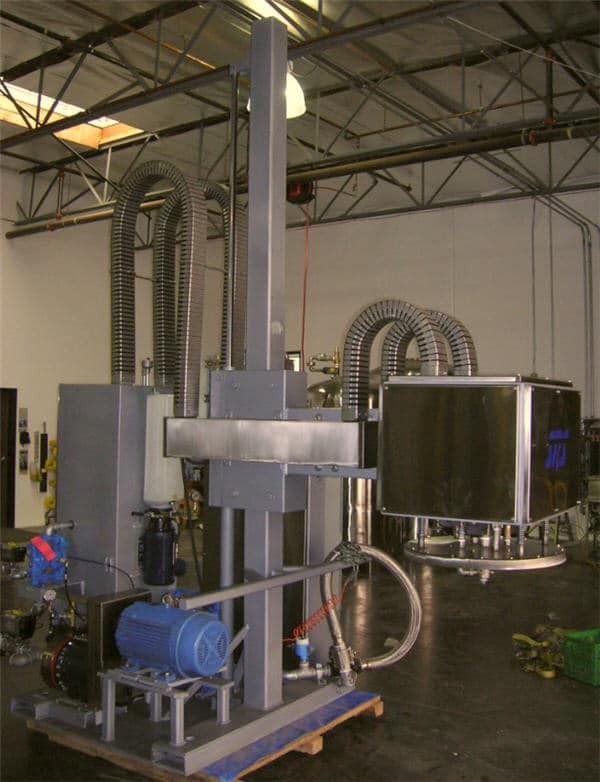 The unit was comprised of stainless steel and was electrical rated 480/60 Hz. 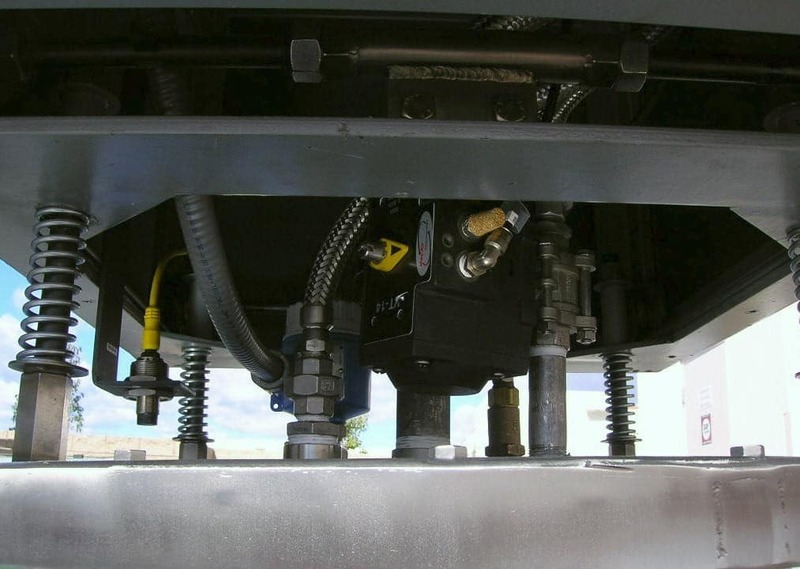 The TW-100-C utilized an insulated and heated wash sump which was built into the base of the system. 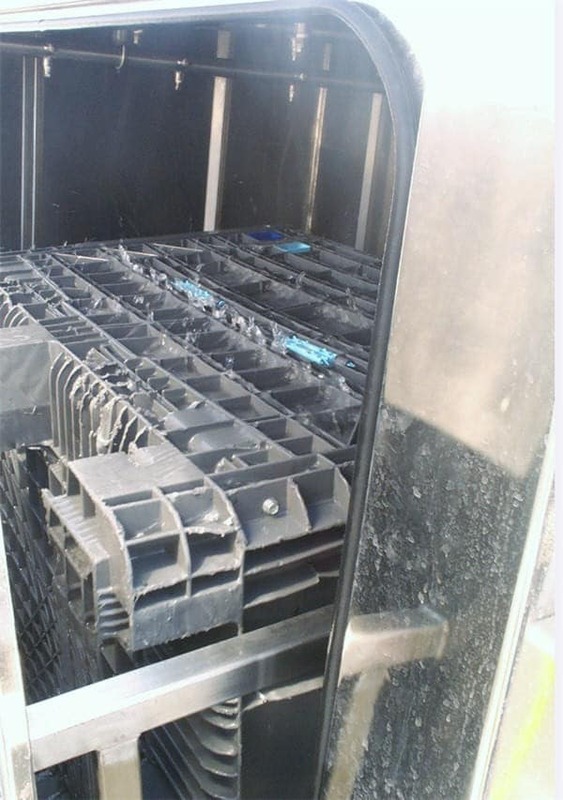 The system allowed them to quickly clean the totes using a clean city water rinse. 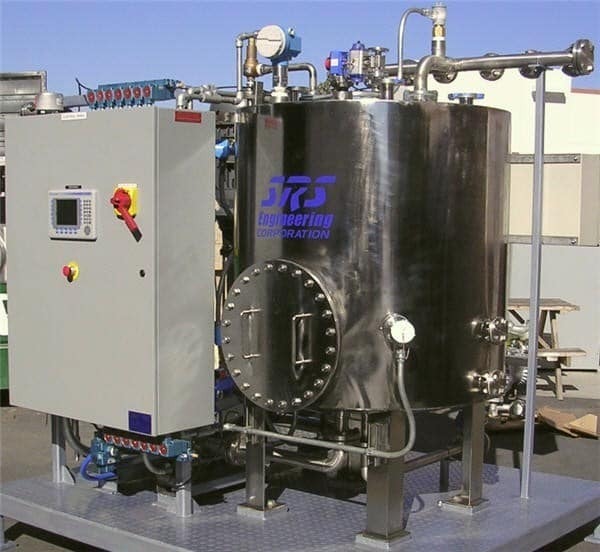 The food manufacturer saw a fast return on their investment because the TW-100-C system was washing at an extraordinary rate which eliminated their need to add more employees. Additionally, the totes were being returned to the customer’s own clients in a more desirable condition. 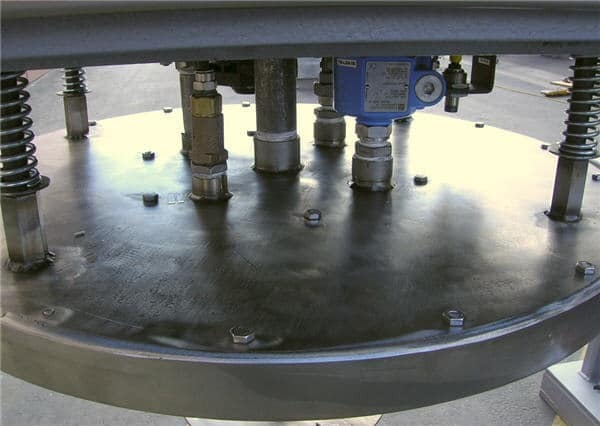 A Real SRS DE Customer Story – A road paint manufacturer came to SRS looking for a washing system to wash their multiple sized tanks and totes (Open and man way topped diameters from 18” to 28”). The tanks and totes were contaminated with water and solvent based road paint and were currently being washed with MEK, Methylene Chloride, and a proprietary solvent blend. 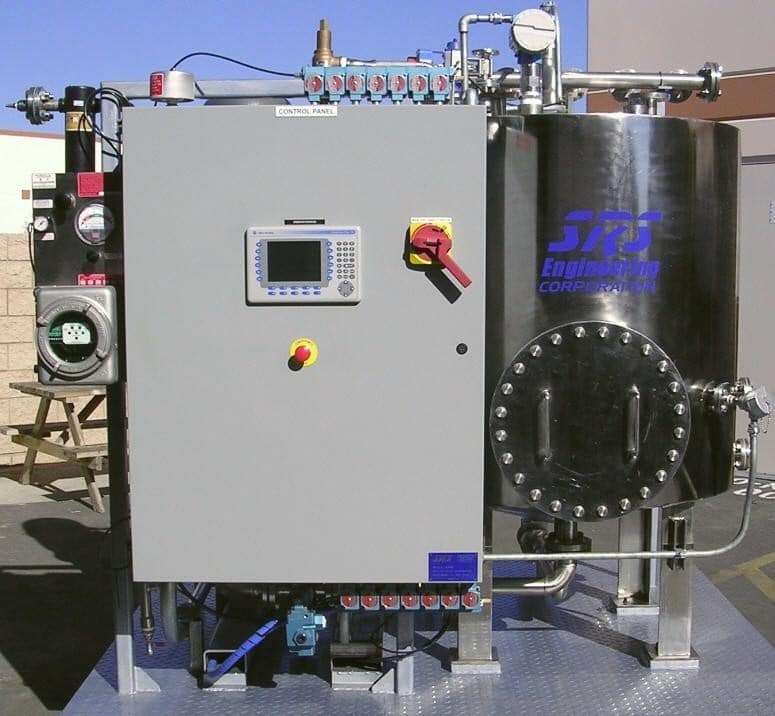 SRS designed and constructed a very high pressure 600 PSI, electrical rated (explosion proof) 460/60 Hz, stainless steel/carbon washing system to accommodate the multiple sized tanks and totes they were currently washing. 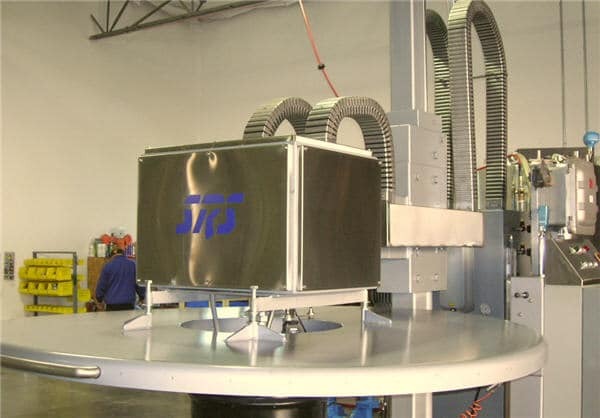 The TW-500 unit that SRS designed for them utilized a custom washer head to wash and rinse the interior surfaces of these tanks and totes. This washer gave the company the ability to remove cured road paints from these units that had been accumulating for years. Adding the TW-500 system to their existing workflow allowed this road paint manufacturer to become much more productive. 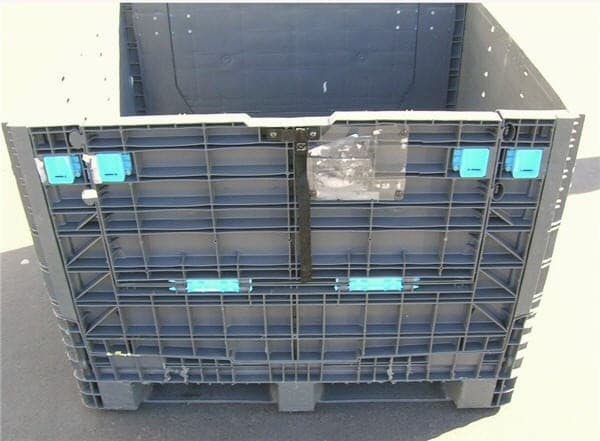 This system eliminated the tedious manual process which involved the operators climbing inside of the totes to air chisel away cured materials. 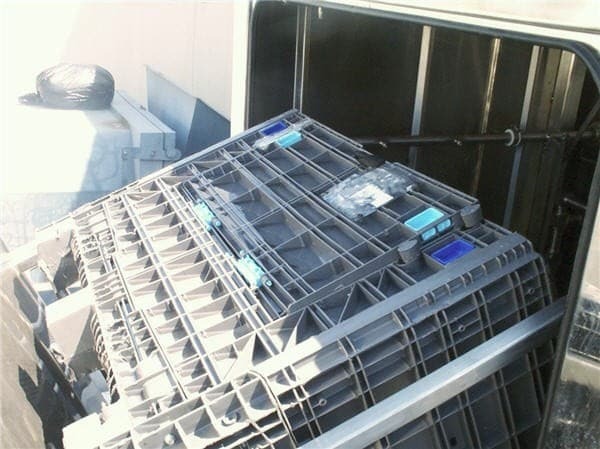 The customer was not only able to wash totes used for daily production, but they could also wash older totes that were deemed unusable from their storage facility. 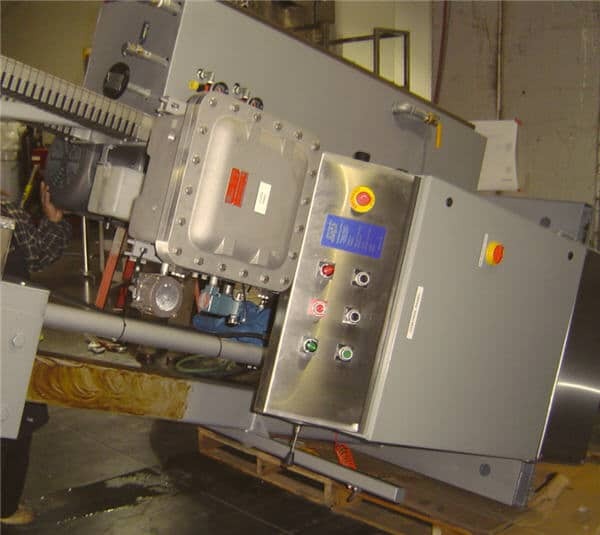 The TW-500 benefited the client in more ways than one by handling their daily washing workload, restoring old totes to a usable state, and removing hazardous working conditions from many of their employees. The TW-500 allowed the company to see a return on their investment in a very short amount of time. 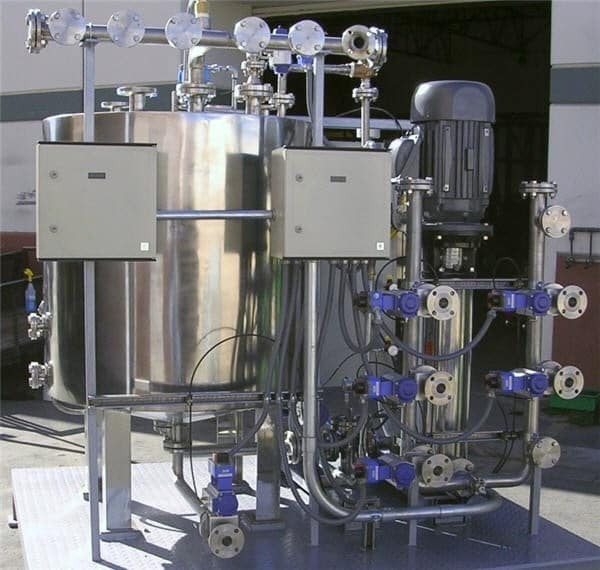 To also cut costs, they purchased a DT-400 dual wash/rinse tank and a SRH-25 unit which allowed them to recycle all of their solvent thus reducing new solvent purchases and reducing waste removal costs. 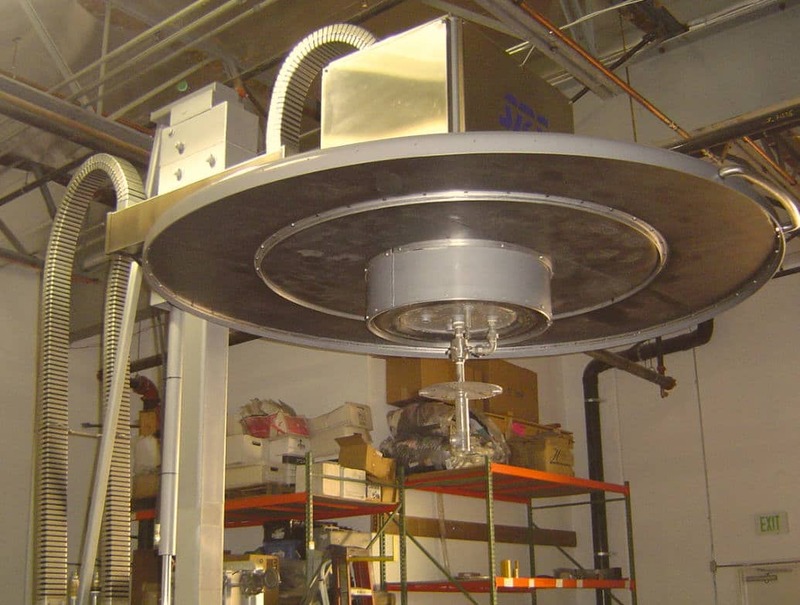 Customer Story – A large Fortune 500 company came to SRS with very specific washing needs for their mixing kettles (250 gallon, 500 gallon, and 1000 gallon sizes). They needed an interior wash and rinse on the kettles to remove contaminants such as resin, pigment, and proprietary cured materials. Currently they were washing the kettles with a solvent blend of xylene, butanol, and DIBK. 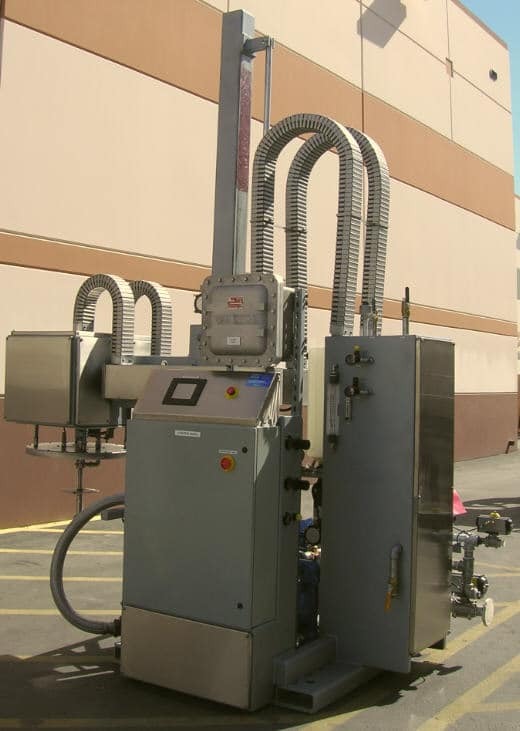 SRS designed and built a skid system (The TW-500M) that would be piped from each kettle location. 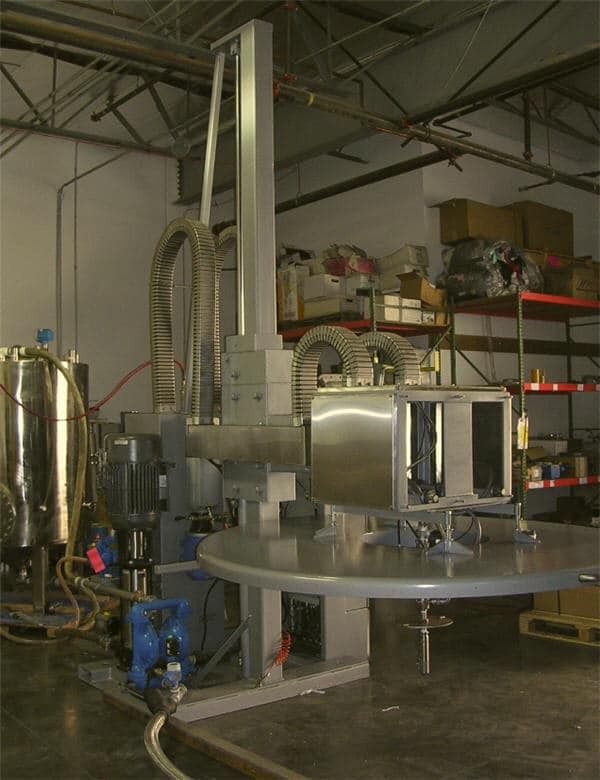 This stainless steel washer had a custom aluminum hand held washer head and was an electrical rated ZONE 0 (Explosion Proof) 380/50Hz. 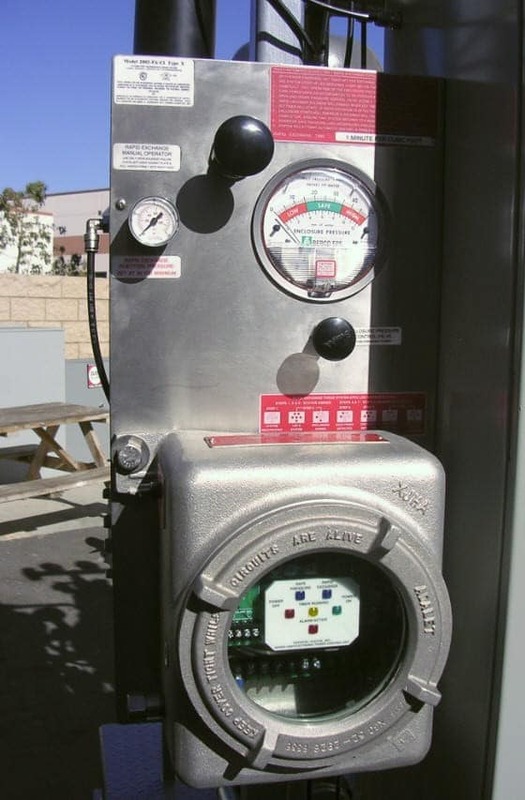 At each kettle locations there was to be a quick disconnect hose connection that the operator could connect to while washing a kettle. 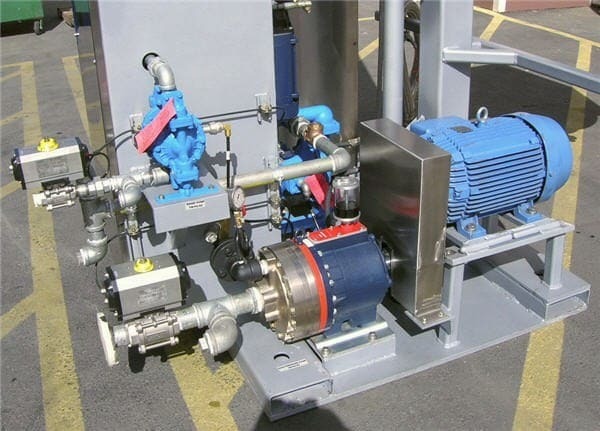 The dirty solvent and waste materials are pumped from a pump located on the SRS skid unit that is connected to each location where an operator will manually connect to the drain valve located on the kettle being washed. The TW-500M allowed the company to become more productive and provided many additional benefits to them. 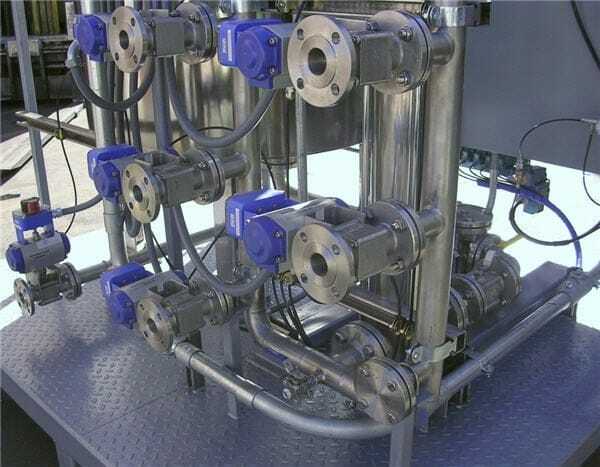 The system not only automated the washing process for mixing kettles, it decreased cross contamination, and gave them the ability to add more kettles as their business needs changed.